Office 2013 is touchscreen ready and cloud friendly, and it adds bold new twists to the Microsoft Office franchise. On Monday Microsoft CEO Steve Ballmer outlined what he said was the "biggest most ambitious Office" update to date. 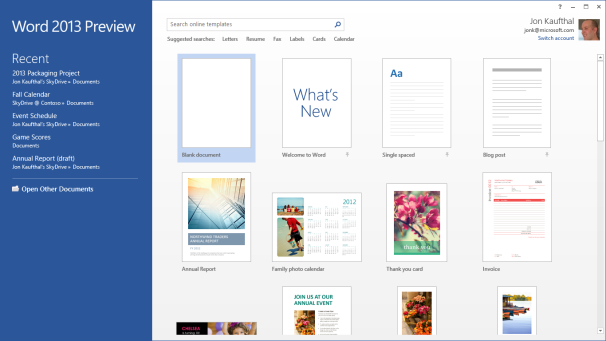 For the desktop, Office 2013 delivers a host of smart updates to Word, Outlook, and Excel. But where Office 2013 shines is in embracing the mobile world and the cloud, delivering deep integration with Microsoft’s cloud service SkyDrive and collaboration through its recent acquisitions Skype and Yammer. Windows 8--and the upcoming release of Microsoft Surface tablets and Windows Phone 8 smartphones--have also played a huge roles in coloring Office 2013 with new features. Ahead of Microsoft's big news Monday Microsoft provided PCWorld with two Windows 8 tablets (no, not the Surface) and access to the customer preview versions of both Office 2013 and the cloud-based Office 365. Here's a look at how the software suite runs on laptop, desktop touchscreen, and tablet platforms. In this story, PCWorld Senior Editor Michael Brown first gives his impressions of working with Office 2013 and 365 on a laptop and a desktop PC. Contributing editor Tony Bradley then writes about his tests of the new products on a tablet PC. I spent most of my time with Word and Excel on a laptop and on a desktop all-in-one equipped with a touchscreen. As expected, Microsoft is tying Office 2013 and Office 365 tightly to its SkyDrive cloud-storage service. You're free to use other services, but I suspect that this integration will lure plenty of Office users away from their paid accounts on Google, Dropbox, and SugarSync. If you buy a version of Microsoft's new software and sign up for a Microsoft Live account, you'll get 20GB of free storage in SkyDrive. The Ofiice 365 Preview settings screen. Both Office 2013 and Office 365 offer largely the same user experience, but Microsoft is clearly steering its customers toward the cloud-based version. The company is also marketing Office 365 to consumers for the first time, rather than strictly to businesses. Purchase the traditional boxed copy of the software, and you get a license to install the software on one device. You can also use Office 365 on any computer or tablet, but that won't be very useful if you find yourself somewhere without your usual computer and without Internet access. Buy a subscription to Office 365, and you get licenses to download and install Office 2013 on up to five devices (right now, the list of compatible devices is limited to PCs and tablets running Windows 7 or Windows 8, though Microsoft says Office 2013 for Mac will be available by the time the final software is released). And, as with the boxed copy, you can stream Office 2013 to any PC or tablet running Windows 7 or Windows 8. Microsoft has not yet announced pricing for either product. The Office 2013 user interface isn't markedly different from the one in Office 2010: The ribbon remains front and center, though the text and the icons inside it are a bit larger and are spaced farther apart. These changes take better advantage of large monitors and touchscreen displays. Nevertheless, the ribbon isn't too big for an average laptop display, even with the addition of two new tabs: Design and Developer (actually, the Developer tab is present in Office 2010, but it's hidden by default). If you're familiar with the ribbon user interface from Office 2007 and Office 2010, you’ll feel right at home with Word 2013. Microsoft has made a number of cool, interesting, and very useful improvements to Word 2013. The Embed PDF feature in Word. On the usefulness front, you can now import a PDF directly into Word, edit it as a Word doc, and then save it as either a Word doc or a PDF. Not only do imported files retain all of the original documents' formatting--including headers, columns, and footnotes--but elements such as tables and graphics can be edited in Word as such. Link your SkyDrive account to your Flickr account, and you can jump to your online photo collection and embed photos directly in the document--again, without ever leaving Word. Like the new version of Word, Excel 2013 feels fresh yet comfortingly familiar. Microsoft has added several new whiz-bang data-analysis tools, including one called Flash Fill. When you take an element of data that you've already entered in one column and enter it in a second column, Flash Fill will predict that you intend to do that for every value in the second column, and will offer to fill in the second column for you accordingly. Excel's Flash Fill feature will notice patterns in your data entry, predict what you intend to do next, and then offer to fill in the rest of the data for you. Microsoft provided a sample two-column spreadsheet to demonstrate how this feature works. The first column contained email addresses in which each person's address was formatted as first-name.last-name@domain-name. The second column was to be used to store each person's first name. Though that isn't the most realistic scenario imaginable, it works. You establish the reference example by typing the first name of the first person in the email address column; then, as you begin typing the second person's first name, Excel predicts that you want to do the same for every other value in the first column and offers to do just that automatically. Press the Enter key, and the second column automatically fills with first names. Colors and symbols can help you analyze data more quickly, and Excel 2013's new Quick Analysis tool uses these elements to identify and highlight trends and changes. Select the rows and columns that you wish to have analyzed, click the icon that appears in the bottom right corner, and choose the conditional formatting that suits your needs. Instead of looking at rows and columns of gray numbers, you'll instantly see a spreadsheet formatted with color scales, bars, and icons. Excel’s Quick Analysis tool automatically suggests conditional formatting that will help you visualize data locked in your spreadsheets. Charts and graphs provide another easy way to visualize data, and spreadsheet software has long permitted users to generate charts and graphs based on the data they enter into its rows and columns. Excel 2013's new Quick Analysis tool will automatically suggest the most appropriate types of graphs--bar, pie, scatter, and so on--based on the data set that you select. My early impressions of Excel 2013 are about as favorable as my corresponding impressions of Word 2013. Microsoft seems to have introduced some solid new features without imposing a difficult learning curve. Take that, ribbon haters. We'll take a closer look at Outlook, Powerpoint, OneNote, and the rest of the suite soon. Microsoft is betting heavily on the idea that tablets are the future of PCs. Like Windows 8, Office 15 was built from the ground up to take advantage of a tablet's unique features, while at the same time addressing the limitations of the touchscreen interface for creating content. I ran Office 13 through its paces on a Samsung Series 7 Slate PC running Windows 8 Consumer Preview to see how well it performs on a tablet. Bear in mind that this tablet runs Windows 8 Pro, not Windows 8 RT, and that Office 2013 and Office 365 differ from the Office for RT apps that will be available on ARM-based Windows 8 tablets. Microsoft has done a great job of making the tools and functions of the various Office applications accessible from a touchscreen interface without lessening the capabilities. For example, holding your finger on a misspelled word will pull up Office's list of possible corrections; and holding your finger on virtually anything brings up the options you'd normally find by right-clicking a mouse. Microsoft did a nice job of fitting all of Word's functions into the screen space of a tablet. I did sometimes find that the options on the ribbon interface were hard to tap. The buttons are a bit small for my fingers, and you can't pinch-to-zoom to enlarge the ribbon in Office 2013. On the other hand, you can make the ribbon bar disappear to maximize the area available for your document--in both Office 2013 and Office 365--which is nice. The Office 2013 suite I installed on the tablet included Word, Excel, PowerPoint, OneNote, Outlook, Publisher, Access, Lync, and a couple of bit players. The only apps available within Office 365, however, are Word, Excel, PowerPoint, and OneNote. Outlook exists in Office 365 as well, but the option was grayed out on the software I worked with. One thing that I like about working with Office on the tablet is more a function of Windows 8 and/or the hardware its running on than of Office itself. The touchscreen virtual keyboard is sensitive and fluid enough to allow me to type at very nearly full speed. Also, tapping the symbols and numbers button brings up an actual number pad, which is much more efficient for entering figures in an Excel spreadsheet. That said, it was a little annoying to have to tap the keyboard icon at the bottom of the display to open the virtual keyboard. It would have been nice if Office applications had recognized when I tapped on a text field, and responded by automatically opening the virtual keyboard. Perhaps, though, Microsoft wanted to respect the limited screen real estate of the tablet and let users navigate documents without having the keyboard pop up all the time. Overall, the experience is solid. Using it differs from using a mouse and keyboard with a traditional PC, but it's a functional arrangement. Microsoft has obviously invested a lot of thought and effort in ensuring that the tablet experience that Office offers is worthy of the Microsoft Office name. If you'd like to check out Microsoft's Office 2013 Customer Preview for yourself, you can download the software from here.